Welcome back to the October issue of the Bangkok Travelbug. 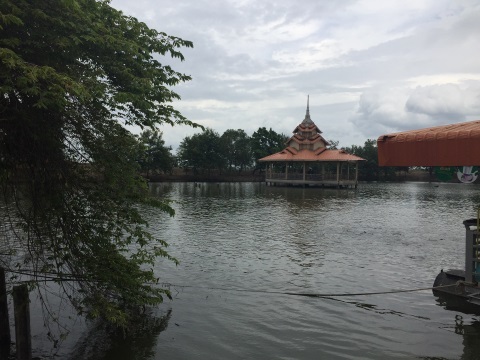 We are still covering Pathum Thani this month and will take you to a very unusual temple. 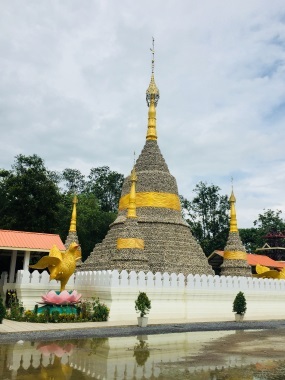 There are several chedi in this temple (a domed shaped structure in a Buddhist temple) that are made of huge oyster shells but these are not just ordinary shells; they are very, very old! It is not known when Wat Chedi Hoi was built. 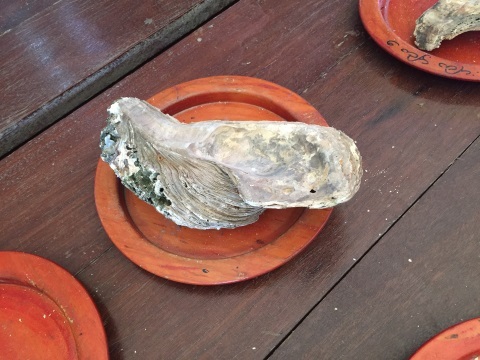 When a pond was being dug in the temple grounds, huge oyster shells were discovered! Archaeologists subjected these shells to carbon dating ⃰ (carbon 14 dating) tests and concluded that the shells are about 5,500 years old! 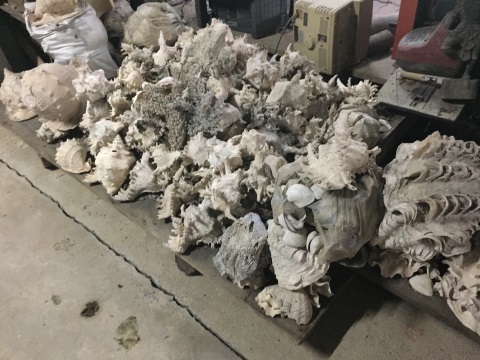 What's more they believe that there are more of these shells in the area. 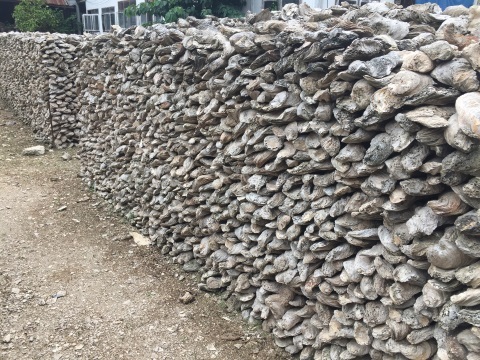 There are huge piles of shells stacked in the temple grounds to indicate the amount extracted so far. 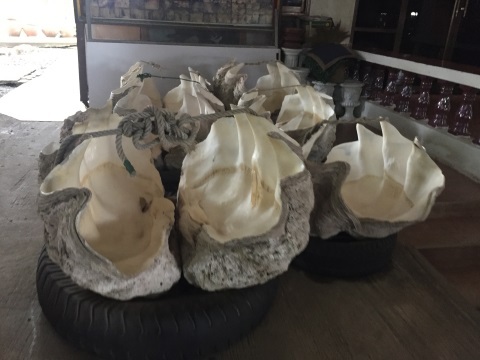 The reason for the existence of these shells date back to the prehistoric period when this entire area, the Chao Phraya basin, was part of the sea. Briefly without being too technical, carbon dating or carbon 14 dating is a method of testing the age of an organism by measuring the carbon 12 and carbon 14 atoms in the organism. C14 atoms deteriorate at a predictable rate whereas C12 remains relatively stable. By measuring the ratio of these two atoms present in organisms, scientists can estimate the age of organisms up to 50,000 years. This method was developed in the late 1940s by Willard Libby who received a Nobel Prize for Chemistry in 1960. 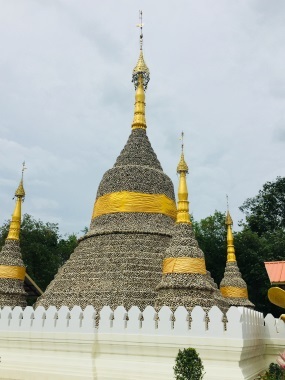 These are the unusual chedi made from oyster shell fossils, the main attraction in Wat Chedi Hoi. 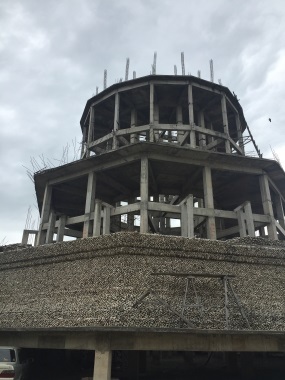 Besides these chedi of shells there is another building under construction that consists of oyster shells as part of the walls. Another chedi in the making? 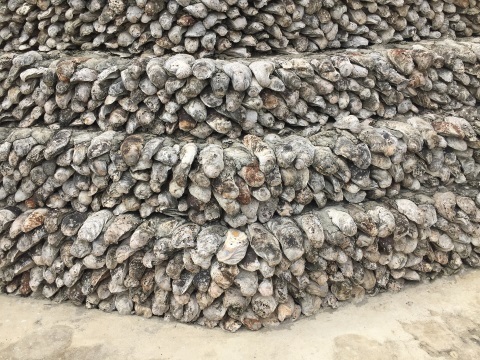 There are huge stacks of shells waiting for future construction. 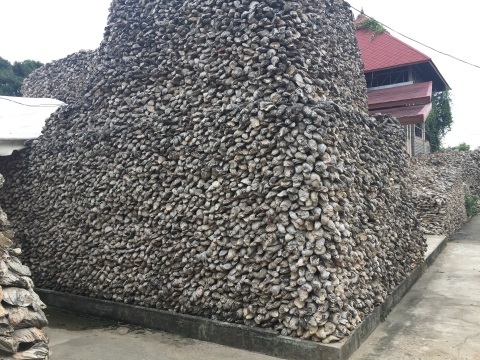 The ground around this temple must surely hold a large of these oyster shell fossils! This is the pond where the oyster shell fossils were first found. 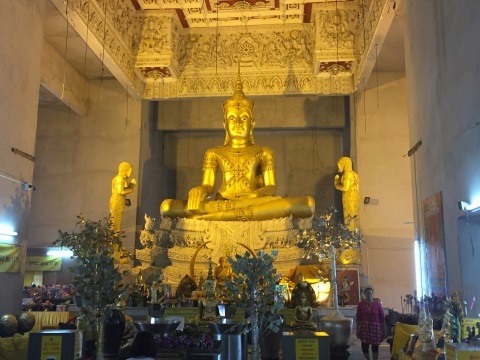 The ubosot or ordination hall is beautiful and there's a huge Buddha statue in the sitting position inside. 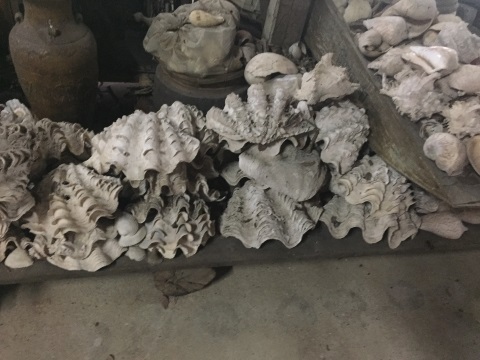 The temple museum is in a wooden shed just behind the stacks of shells fossils. 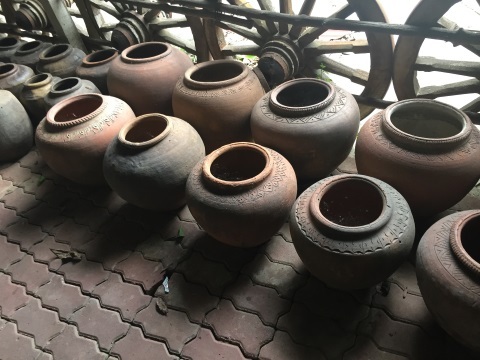 It's a collection of various old items ranging from pots, urns, shells, sculptures and even old typewriters and cash registers! Many of the broken pieces of pottery are just piled up. Here are some of the more relevant displays. There's another building behind the ubosot that houses other displays which are a mix of old and new. 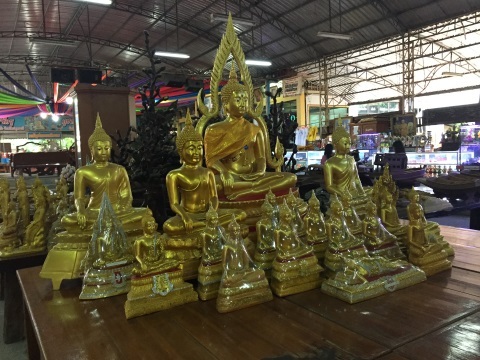 The displays include wooden furniture, Buddha statues, old bones, shells and statues of various deities. And here are some really huge oyster shell fossils. One of these would be a meal! 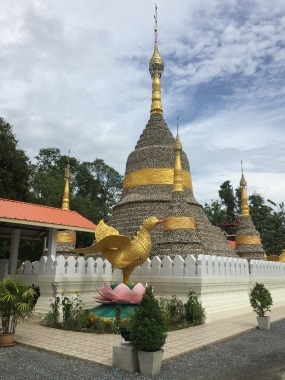 Here a parting shot of these unusual chedi covered with oyster shells fossils. Wat Chedi Hoi is probably the only temple in Thailand that has this characteristic. 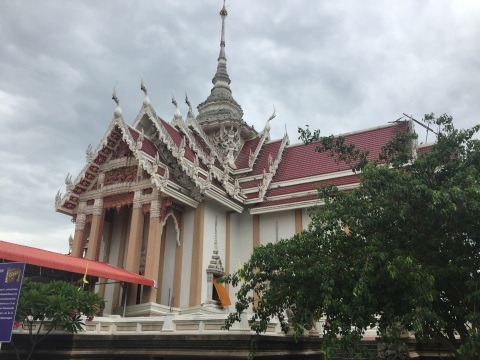 There's another temple in Prachinburi lined with shells on the inner walls. Now it's time to hit the road and get home after a pleasant Saturday outing. Hope you enjoyed yourselves, see you next month.